One of the hardest decisions all motorcycle riders have to make at some point before a trip will be what equipment, tools, clothes and other items to carry on the motorcycle adventure. I have ridden my motorcycle all over the USA and Canada both on short and long rides and have had to make the hard choices. 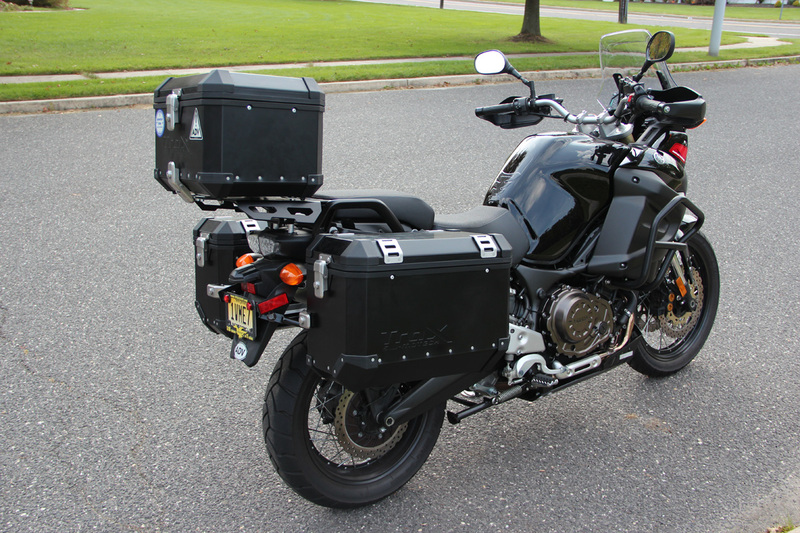 I am lucky that I have lots of storage on my motorcycle, a luxury not everyone has but the more space you have the more things somehow accumulate as you prepare for a trip. 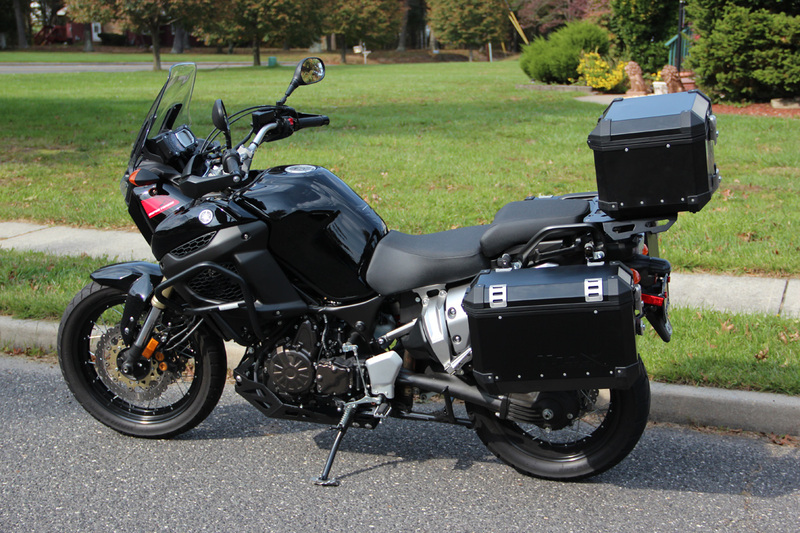 The more equipment the heavier the motorcycle will be too, not the ideal scenario. What you carry will depend if you will be staying in motels or camping. When camping you will have to carry the tent, the sleeping pad, the sleeping bag and cooking equipment. If you going through very cold weather a much heavier sleeping bag and pad will be needed. The type of weather you are likely to run into will also affect the clothes needed. You might start the trip from a hot location and end up traveling through cold mountains or high altitudes were it will most likely be cold. You will need clothes for warm and cold days. You have to be prepared for the unexpected too. Then there's the electronic devices and chargers. Almost everyone carries a phone and a small camera at a minimum and the two chargers that go with it. If you are a photographer like me than a bigger camera and lens or multiples lenses are a must. I usually carry my Canon T3i with the 18-135mm lens. I also carry my 10-22mm wide-angle for the landscape shots. The camera will need a charger and a spare battery. A tripod is another good option. If you are a blogger than a laptop is a necessity. I have a small laptop and since I don't trust laptop hard drives I carry a small portable hard drive for backups. The laptop requires another power supply but you can get external USB drives that do not need a power supply, they get the power from the USB port. I carry a 320GB drive with me. I recently bought a Chromebook to carry on my future trips, it weighs less than 3 pounds. The power supply is smaller than most. 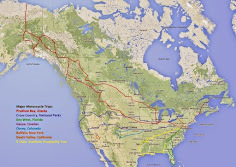 The photos below show how I prepared for my trip to Alaska. The duration of the trip and location will throw another curve into the decision. Everyone should have a few basic tools but if the trip is to remote locations you might need a better assortment of tools. You might even have to carry tires if the country you are traveling through doesn't have them. You will have to think about fuel, will your motorcycle have the range needed for certain areas. 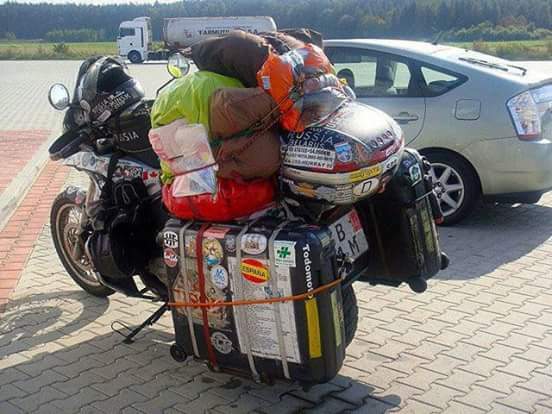 The photo below shows how my Super Tenere was loaded the day before my 34 day trip to Alaska. I camped most of the time, I'm a good packer. I have also seen riders that go completely overboard with their equipment to the point of making the motorcycle dangerous to ride in my opinion. If you have to ride through soft sand or mud you want the weight on the bike as low as possible and if you tip over you have to be able to pick the bike up again by yourself. Below are two examples of amazingly overloaded motorcycles. Now if money was no objection and I was going to travel the world for a few years then maybe something like the truck below would be better. 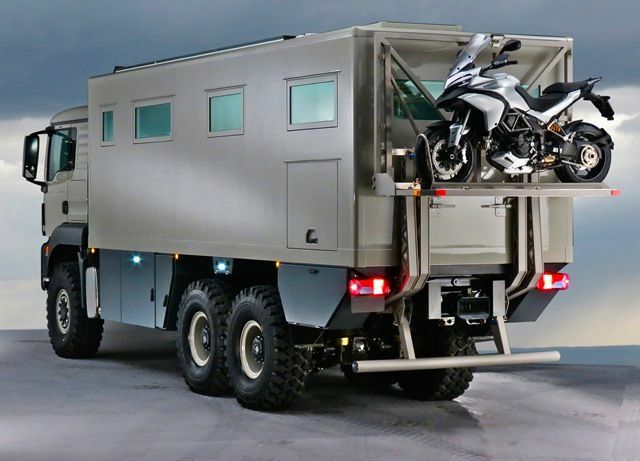 I would drive the truck to a new country or location, park it and then use the motorcycle to explore the country. I could have all the amenities of a home and still have the motorcycle for short distance adventures. When I was in Alaska I met a German couple that was traveling the world in one of these but they were not carrying a motorcycle. For me a motorcycle would be a requirement. The trucks are great but the cost of the truck and the transportation to different countries can make it extremely expensive. A truck like the one above can cost up to a half a million dollars. So as you prepare for you next big adventure, think about what you will need, make a list and then remove half the stuff. You can always buy equipment as needed. Maybe you don't need heavy clothes for cold days for half your trip, you could pack light and later buy or have the warmer clothes shipped to a location on your trip or vice versa, start with heavier clothes and equipment and then ship it home when it is no longer needed. If you are traveling with a companion and both have the same motorcycle, maybe you can split the tools. 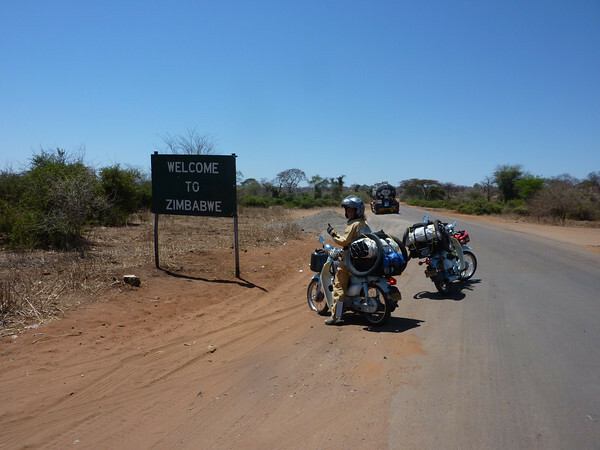 If you are a couple traveling together on two motorcycles than one can carry the tent and sleeping bag while the other can carry the cooking utensils and sleeping pads. One carries the computer and the other the cameras. What's important is that you travel as light as possible while still prepared for the unexpected. 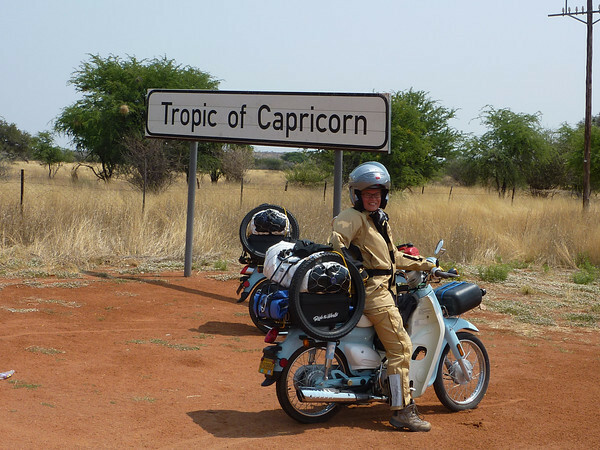 If you have to carry the house on the motorcycle than it's no longer a motorcycle adventure. Have you seen the inside? they are pretty amazing and this type of truck will go anywhere. It looks like a lot of stuff but it all fits. How much does it all weigh? They are amazing trucks, probably heavy but they can go anywhere. Have you ever seen the Dakar Rally and the big trucks? they can travel across the desert soft sand. I like the idea of driving and taking a bike as you can cover a more miles and it can be easier to stop for taking pictures, but at the same time it is fun to travel by bike. 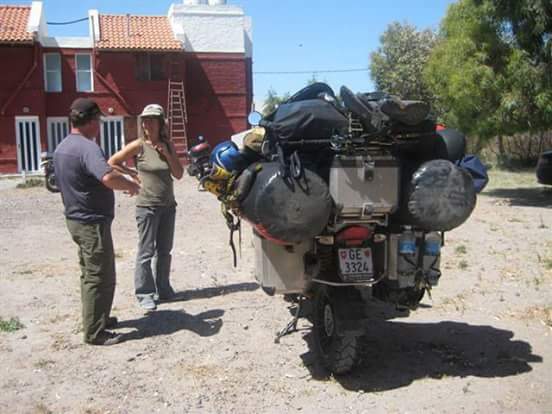 Did you ever stop at a weigh scale with your Tenere loaded down to see what it weighed? Oh don't get me wrong, I would prefer to travel around the world by bike but my wife would not. I did weigh all my equipment when I returned and I believe it came up to a total close to 900lbs with me. I have it written down somewhere. Camping? Right now we're planning on camping at Holiday Inn Express along the way. But I can certainly understand the attraction of sleeping in a tent next to a comfortable campfire. You've provoked some thought... thanks. Thanks for reading Greybeard. You will enjoy the Blue Ridge Parkway and the Skyline Drive if you continue going north. Both are beautiful roads, you will have fun. Enjoy and stay safe. After years of riding, I've learned (except for emergency equipment) if I haven't used it in the first few days of an adventure I send it home and don't take it again. Moto camping has made me an minimalist not only in my travels but also life. Great blog you have!